Because theTibetan Terrier has a profuse, often thick double coat, the breed must be groomed on a regular basis. If this is done consistently, it can be enjoyable for both dog and owner. At the age of or around 10 months the Tibetan Terrier will go through a coat change and the Tibetan Terrier will matt everyday for about three weeks. 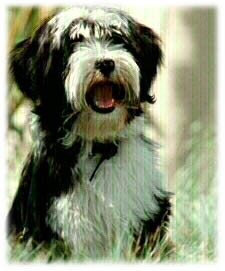 The color of the Tibetan Terrier is merely a matter of choice and accessibility. 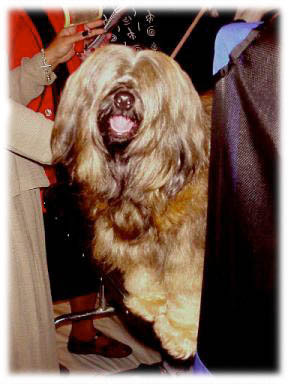 The Tibetan Terrier was never bred for color, since it was considered more important to breed for sturdy good health, loving temperament, and correct type. At this point you will need to brush him or her everyday to pass this point of a coat change. The Tibetan Terrier can be cut into a puppy cut, but beware not all groomers know how this is done and your dog will come home looking like another breed. Ask the breeder for help in finding someone who can hand scissor the Tibetan Terrier. Clipping the Tibetan Terrier will not make him or her look like the shaggy Tibetan Terrier that you puchased. All colors are equal in the breed, and the range is wide: from pure white to jet black, with goldens, silvers, brindles, fawns, parti-colors and tri-colors.